Not a true trout, the bull trout is a native char that is closely related to the Dolly Varden. 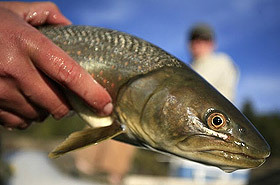 Bull trout are present in The Bitterroot River and Clark Fork River, with good numbers on Rock Creek and the Blackfoot River. It is a voracious carnivore that can grow to very impressive sizes often exceeding 30 inches, especially in the Big Blackfoot. Once maligned and killed as a trout slayer, the bull trout is now protected, and even celebrated. It is a “canary in the coal mine” species whose presence means pristine water quality and a healthy environment. If there are bull trout in the river, that is a pretty good indicator of a healthy ecosystem. Bull trout numbers are very low compared to historical levels as a result of their reputation and previous degraded water quality so are a protected species. Since they are protected, fly fishing for bull trout is not legal and they are not deliberately targeted. Occasionally a bull trout eats a streamer or san juan worm intended for a trout, or attacks a small trout or white fish that has taken a fly. If such is the case, you must release it immediately, but first you will have a memorable fight with this native behemoth. Bonus!